Dr. Vinay P is a prolific writer and a noted scholar in the field of Vedanta and Sanskrit literature. Dr. Vinay is one of the top-brass debaters with the high level of expertise in the technicalities of traditional Sanskrit debates, equipped with the sophistications of Navya Nyāya and advanced Vedanta. He has been a frequent speaker in various national and international seminars. He has numerous research papers, lectures, articles, and criticisms to his credit. Dr. Vinay is a streak of the intellectual lightning of the modern Indian scenario. A critical study on the “Mithyātva Anumāna Khandanam” of Śrī Madhva in English (included in the prestigious Google Book Search) is a voluminous critical acclaimed and world-renowned authoritative work on the text. Working on research papers related to Vedanta, Western Philosophy, new frontiers of Vedanta Mathematical logic, Semantic automation using Tarka, Grammar, Syllogism, Aristotelian and Analytical logic, Theory of fallacies, and others. Dr. Vinay holds Vidwat Degree in Dvaita Vedanta with high distinction. He has cleared NET and SLET Examinations. He has been awarded Ph.D from the University of Mysore for his Doctoral Thesis: “A critical study of the examination of the Sruti texts in the Nyayamritam”. Dr. Vinay P has undergone intense training in Nyayamrita as the Fellow of the Nyayamritam, sponsored by VMS, USA. Dr. Vinay P has 10 years of teaching experience. 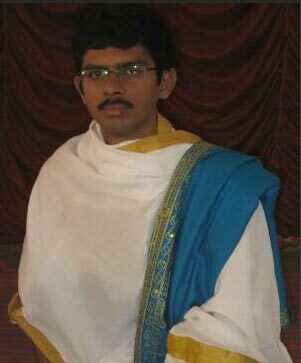 He is the Hon.Co-Executive Editor, Tattvavada (Journal) pertaining to Vedanta.. Post-Doctoral research fellow on “Pramana Mimamsa – A comparative analysis on knowledge & its means in Indian philosophy”, Awarded the title “Vyasaraja Seva Durandhara” by world forum of Vyasaraja Devotees, Listed & recognized in creative Sanskrit writers in Karnataka. Dr. Vinay is computer-savvy and works on varied software applications, platforms and programming. An exponent of Carnatic classical music who plays on the Veena, the Flute, vocal singing, a lyric composer and poet, a student of South Indian percussion art, who wields his pen in Sanskrit, English and Kannada languages. Dr Vinay is a morning star on the horizon of Indian philosophical heavens. Chamarajpet, Bangalore – 560 018. © 2019 - Karnataka Samskrit University Site best viewed in Firefox (3.6), IE(8.0) and Chrome (18.0).